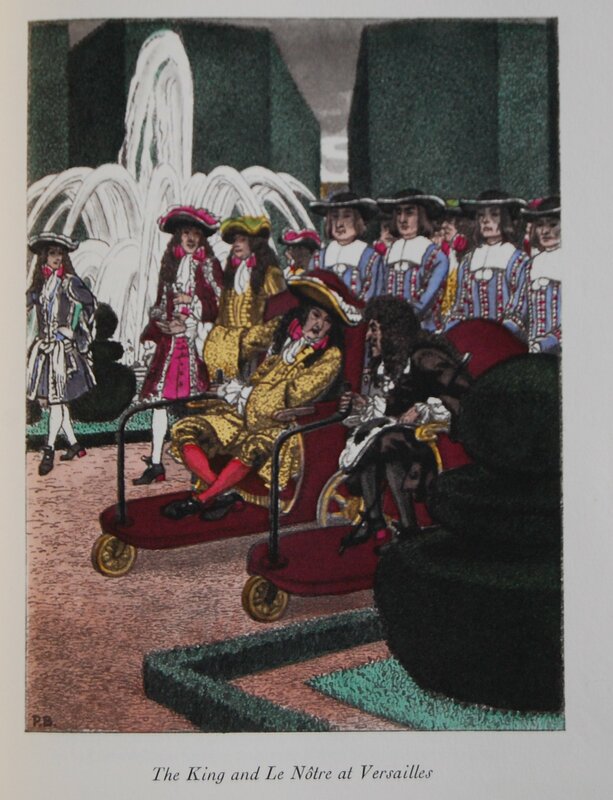 For the memoirs of French soldier/diplomatist Louis de Rouvroy due de Saint-Simon, Sir Francis Meynell (founder of the Nonesuch Press) handled design duties. 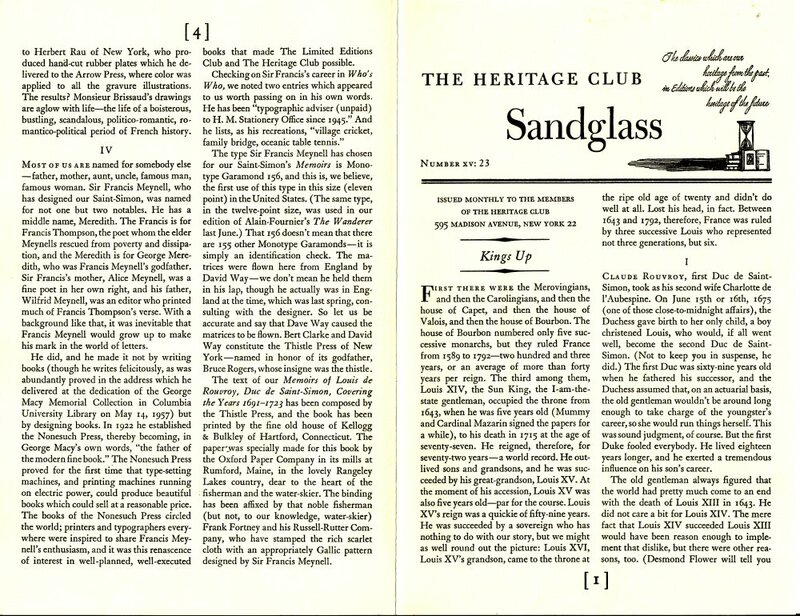 He chose Monotype Garamond 156 to serve as its font (which, according to the Sandglass, was likely the first time the font had been used in an American book! 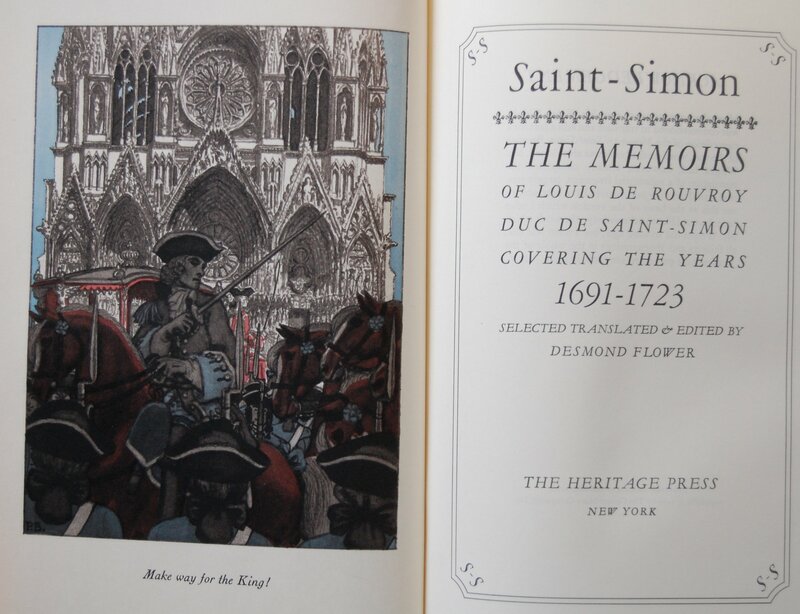 ), and the George Macy Company recruited Frenchman Pierre Brissaud to render the royality-filled world Saint-Simon depicted in his memoirs into illustration. Brissaud is no stranger to this blog, with his Cyrano de Bergerac and The Story of Manon Lescault being highly praised by your faithful curator already, and this is another testament to his astounding talent. As for the comparative aspect of the two versions, the Heritage is one volume versus the LEC’s two, which is fairly obvious methinks. 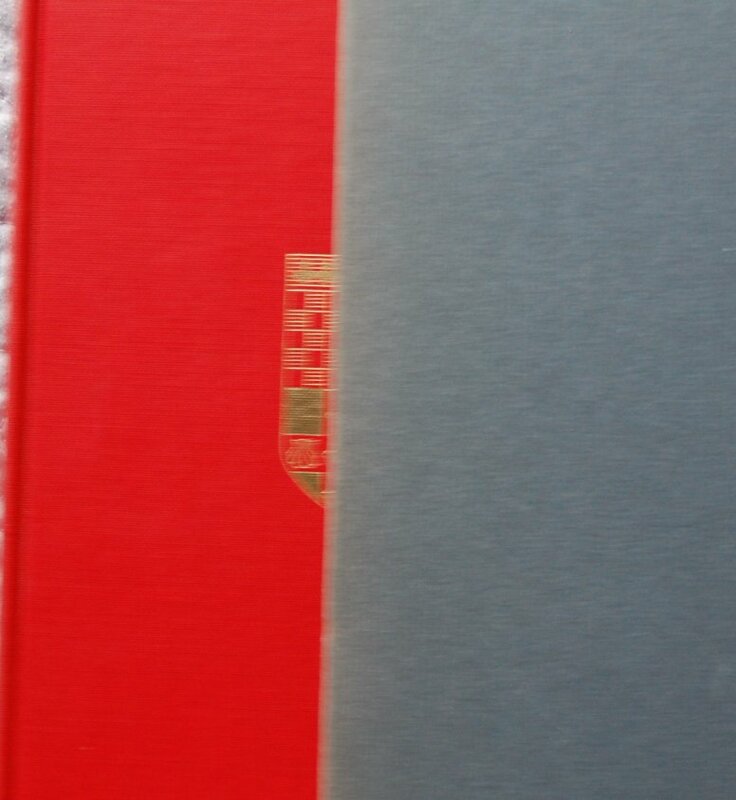 Secondly, the Heritage lacks the decorative gold border by its edges. Third, the spine designs are different, which you can see below. 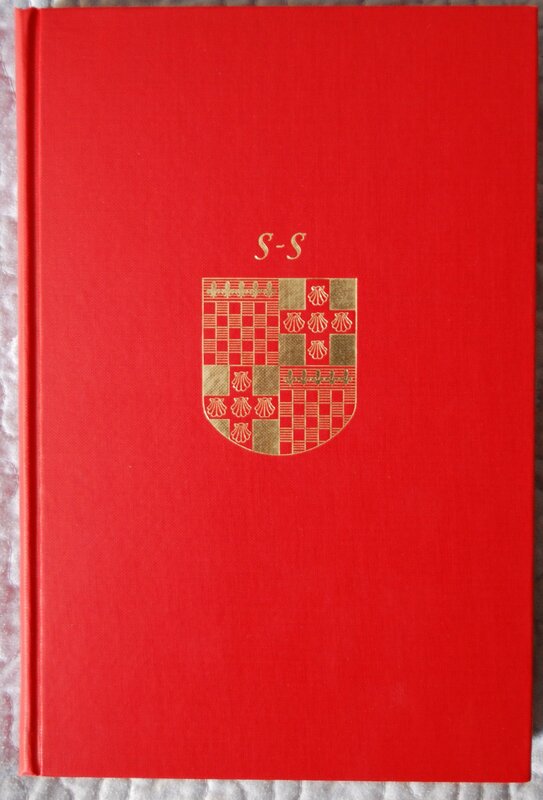 Spine – The LEC has faded into a light yellow-orange compared to its vibrant red. The sun is a harsh mistress. 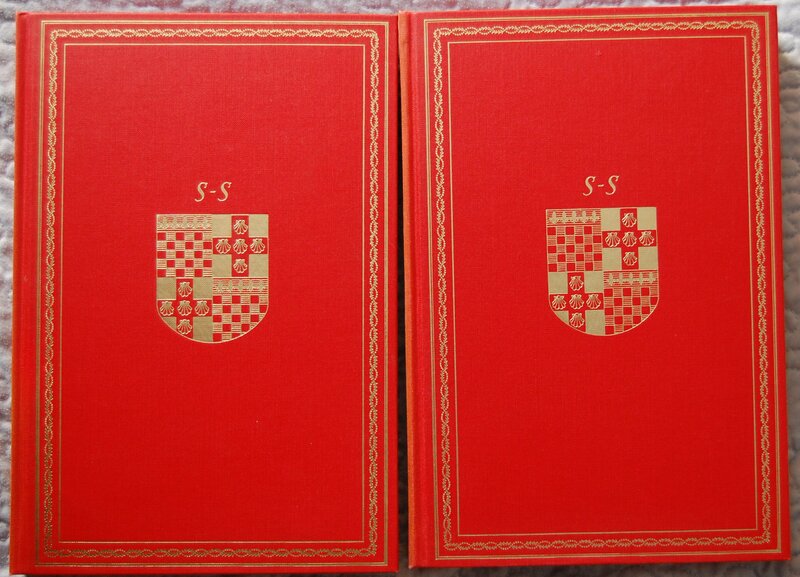 Slipcase – Sorry for the fuzziness on the HP slipcase. Both went with blue, and it works nicely. Title Pages – The Heritage ran with the second volume’s title page for its own, and I also think it’s more colorful than many of the other selections in that edition. The major difference here is the lack of a Volume announcement and the year being dropped in preference for “New York”. You can compare the Heritage rendition of the LEC title page below. Clarke and Way of The Thistle Press were responsible for handling the LEC edition – without a letter, I can’t go too deep into the process. 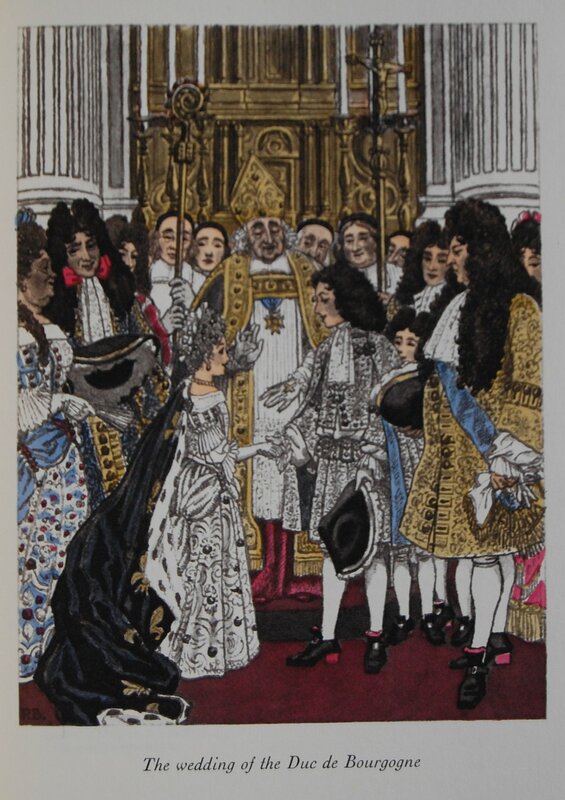 Brissaud’s artwork was reproduced into gravures by the Photogravure and Color Company, and after Brissaud colored the gravures and sent them back to the George Macy Company, the artists at Walter Fischer Studios rendered each book’s illustrations into those colors by hand. A quick run-down of the Heritage printing process: printed by Kellogg & Bulkley of Hartford, Connecticut, on specially made paper provided by Oxford Paper Company, bound by Frank Fortney of Russell-Rutter. 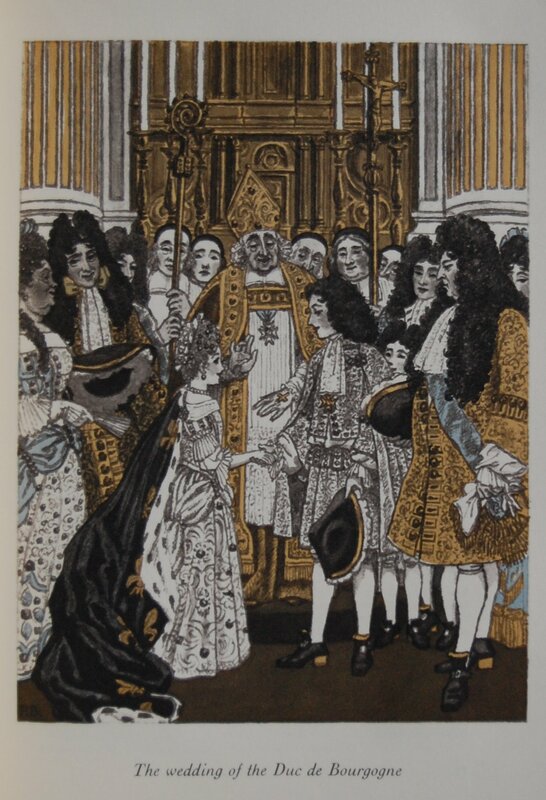 Colors were done by the Arrow Press based off of Herbert Rau’s rubber plates taken from the gravures Brissaud colored. 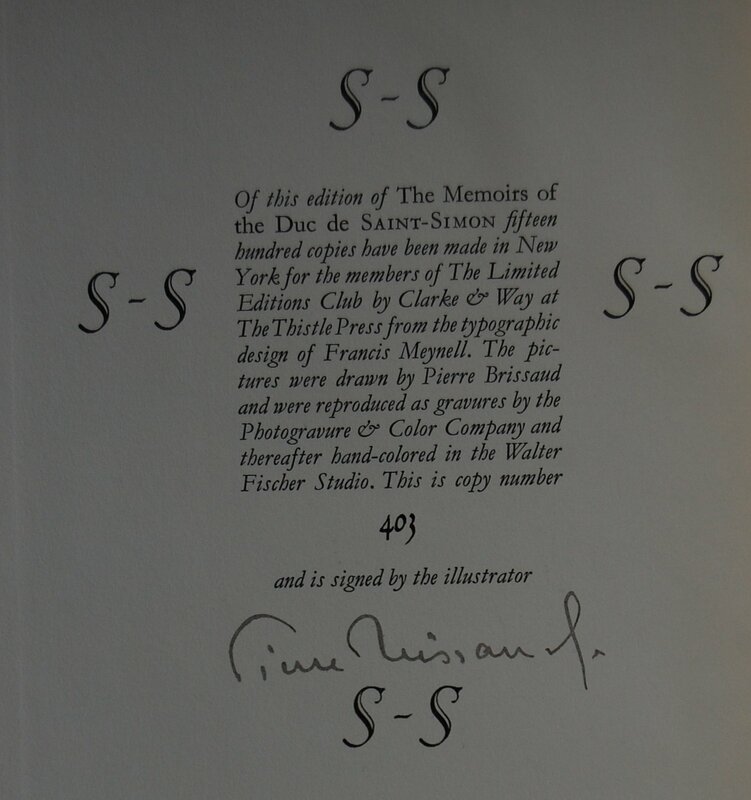 Signature Page –#403, signed by Brissaud. 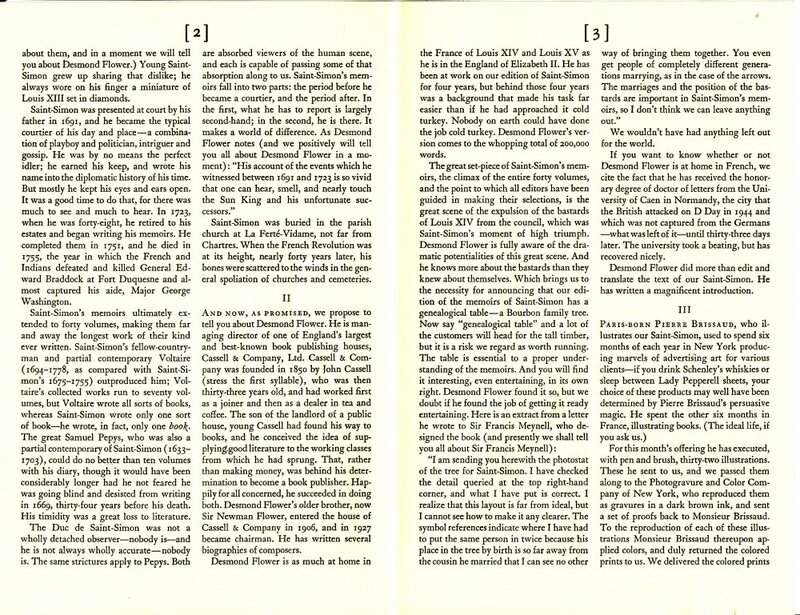 Page 28 (LEC)/Page 26 (HP) – Note how colorful and rich the LEC edition is compared to the more subdued Heritage. The addition of additional colors makes each scene in Saint-Simon’s life re-imagined by Brissaud flourish in its resurrection. The Heritage is almost the afterimage of such glory. The colors really do make the argument to go with a LEC edition for this particular biographical memoir. Page 3 (HP) – Compare with the LEC title page. 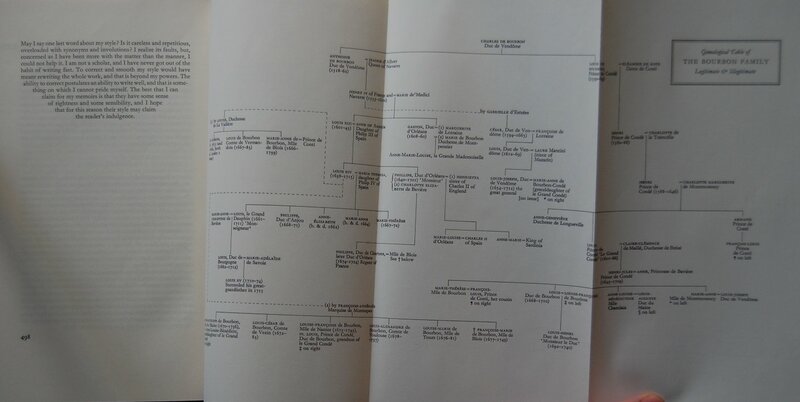 Genealogical Tree (LEC) – This is bound into the second volume of the LEC edition at the conclusion of its tale, while the Heritage is loosely lain into the book. Personal Notes – I picked this up for $45, and it’s in splendid shape beyond the sunned spines. Acquired from my favorite shop in its top secret locale. :p The Heritage was purchased for $12 at the same store a year or two prior, if my memory’s correct. I had a chance to discuss with the owners a bit of history relating to the member whose estate the shop bought this lot of LEC’s from. #403 was based in Carmel, California, and had a lovely house that was more glass than anything else. That explained why so many of the books seemed to have been sunned so heavily. It would seem from my experience that #403 was with this collector from the mid-to-late 1950’s to the early 1980’s. This and Three Men in a Boat make for eight books from this member’s collection now residing in mine. A good post since I suspect not many LEC collectors have read this interesting book. And my copy, kept in my sun-blocked room, is still bright red. I read the S-S Memoirs about ten years ago, but at that time my knowledge of French history and the reign of Louis xiv was skimpy. 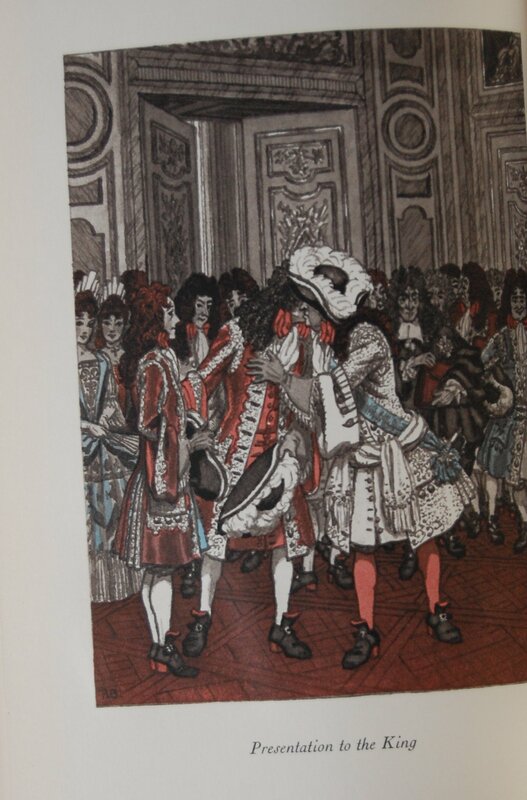 I would suggest reading first The Sun King by Nancy Mitford (published last year by the Folio society). Even though English, Mitford lived in the town of Versailles, and like many non-historians, she wrote an interesting and informative book. And it prepared me for the many nuances brought out by S-S. This of him they said. But all his books were read. 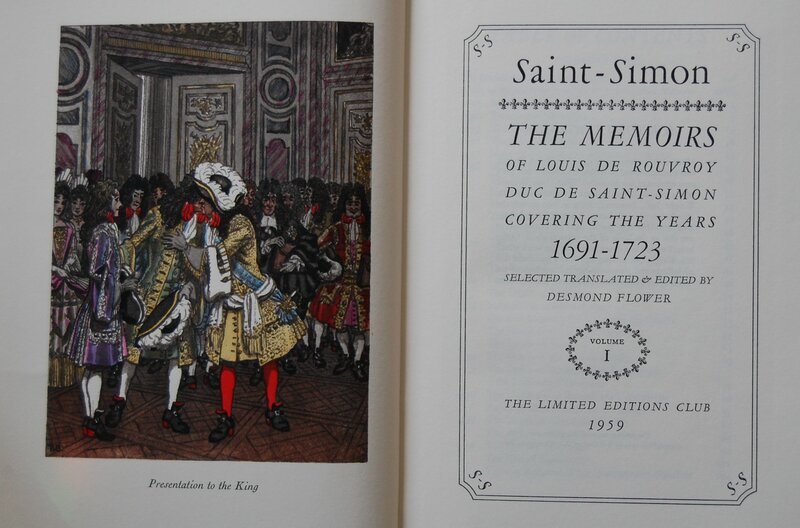 You are currently reading Limited Editions Club – The Memoirs of Saint-Simon (1959) at The George Macy Imagery.